Note 1: Like dodge ball games? Check out my review of the Neo Geo version of Super Dodge Ball? 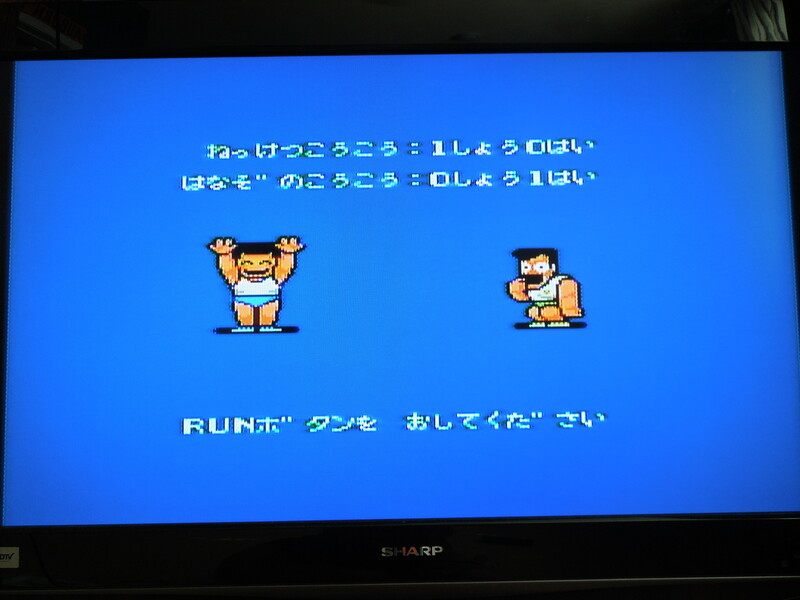 Like Nekketsu games like this one? Check out all my other Nekketsu reviews! 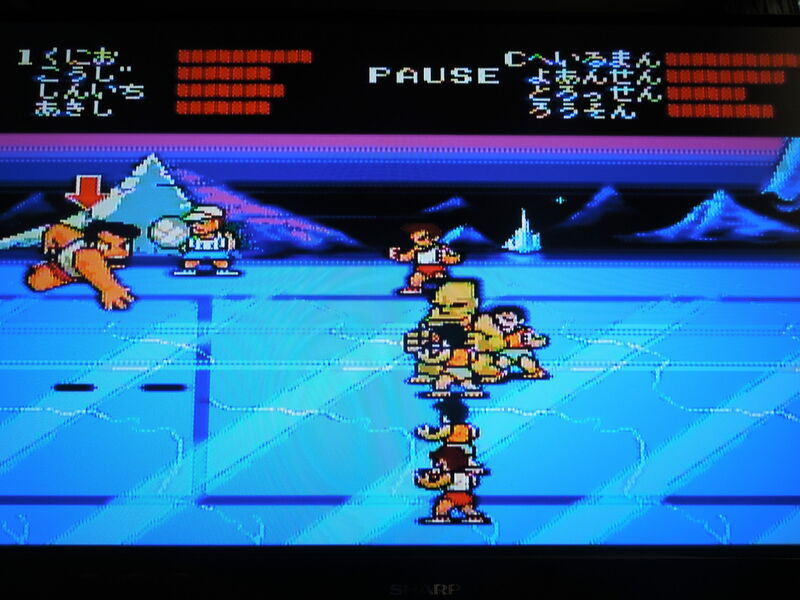 Note 2: This game was played on a PC Engine Core Graphx console with AV (red, yellow, white) hook ups. It was connected to a 32 inch-HD tv. Play against the best International Dodge Ball teams, like (evidently) Iceland. 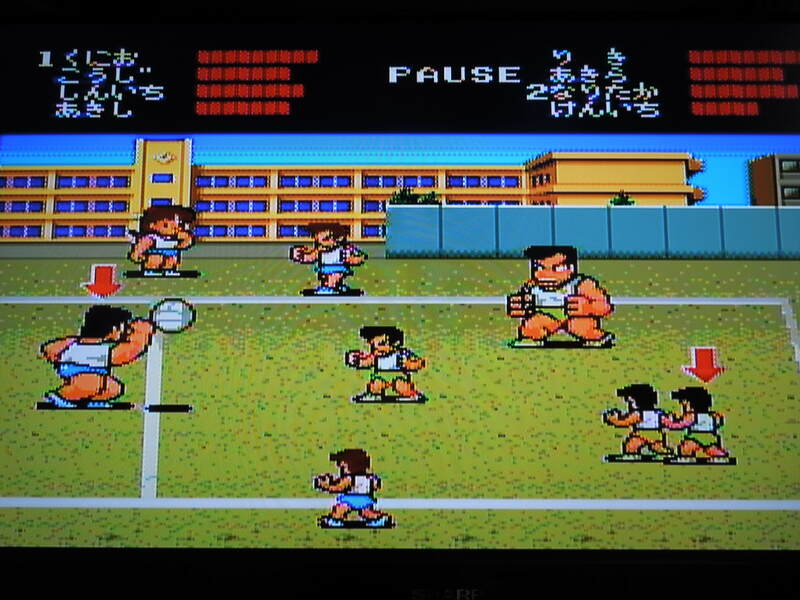 Quick History: An exclusive release for the PC Engine home console in Japan in 1988, Nekketsu Kōkō Dodgeball Bu: PC Bangai Hen, or Super Dodge Ball, is based on the arcade game of the same name. 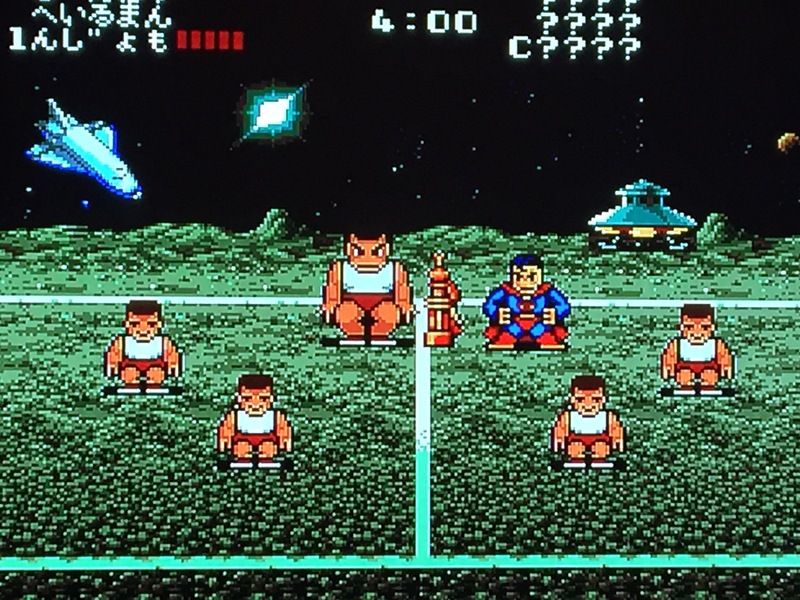 While this PC Engine version is based on the arcade game, it is not a direct port, although the visuals are very similiar when compared side by side with the arcade version. 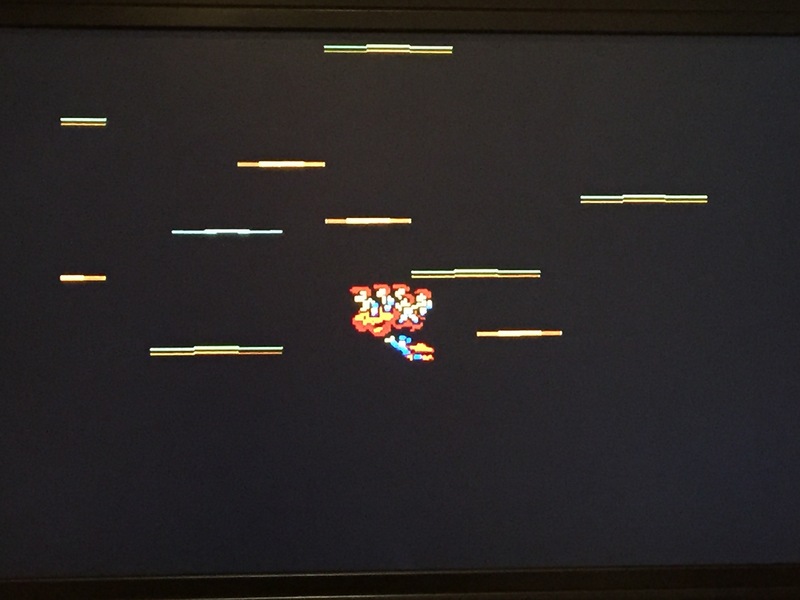 This version, however, added several elements of gameplay missing in the arcade version. Sadly, this version was never translated and released on the Turbografx-16 (U.S. version of the PC Engine). 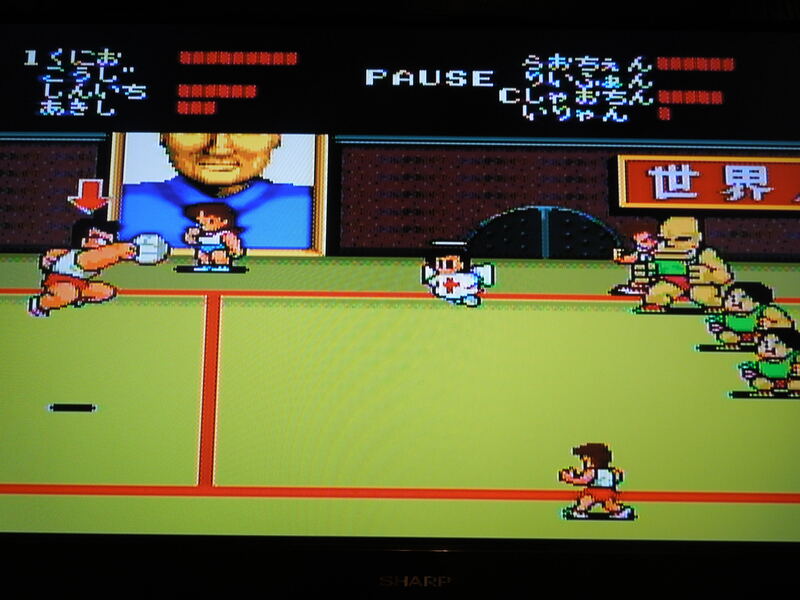 Gameplay: Super Dodge Ball is a game from the popular Japanese ‘Kunio-kun’ series of games. Super Dodge Ball has 3 modes of play: Arcade (1 player), VS (2 player), and Story (1 player). Arcade has you, as Kunio and the Japanese Dodge Ball Team, taking on 6 other teams in an International Dodge Ball Tournament: the Japanese All-stars, England, Iceland, China, Africa, and the United States. Each team has their own unique stage which looks great. Each team is harder than the one before, basically. Beat all the teams, and you’ll get one of the top-five endings in video game history: Superman presents you with the Dodge Ball Championship Trophy! Each match is timed in Arcade, starting at 4 minutes per match. After every successful playthrough of all 6 teams, 30 seconds are deducted from the clock, forcing you to try to beat each team in less time. This is the game’s true challenge. If you play successfully long enough, you can work the clock all the way down to 1 minute, 30 seconds, the game’s lowest setting. Can you beat every team in that short of a time? It is HARD, and requires time and patience to not only get that far, but to beat the game with such a short time limit. Good luck! PC Engine Hu-cards (like SDB) are extremely compact, just like the console itself. In VS for 2 players, the game keeps track of the win/loss record of you and a friend. In VS, you compete against another human player. This mode is great, as it keeps track of the win/loss record between you and a friend between rounds. Unfortunately, you cannot choose all of the teams in the game the way you might expect. 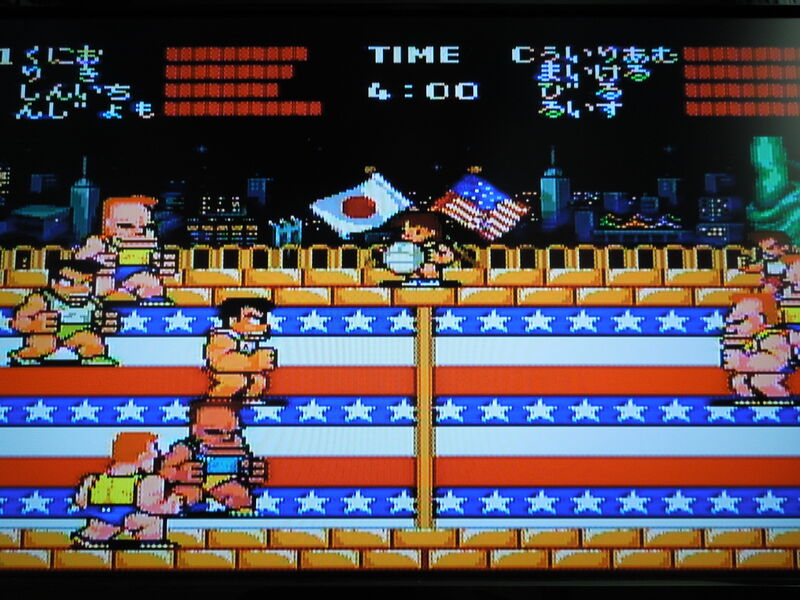 Instead, you are limited to Player 1 being the Japanese Dodge Ball Team and Player 2 being the Japanese All-Stars (who are mirror image teams with different colors, by the way). It’s great VS fun, but why you can’t pick the other countries is a mystery, and it would have greatly improved VS. In Story Mode, you guide your dodge ball team through a hunt for aliens masquerading as dodge ball players. You battle the other countries like in Arcade mode (although you can pick the order of whom to face this time), but this mode has a great addition. After you beat a country, you have the option of replacing one of your players with a captain from another country (who is much stronger than your ‘sidekick’ players). Occasionally, as you battle these teams, after you kill a certain opponent, he’ll turn into an alien and be rescued by a UFO. After you find 3 aliens, you’ll travel to the moon for a showdown with the ultimate dodge ball team. An additional Superman ending awaits if you beat the tough moon team. Rules of Dodge Ball: It is a 4 on 4 game, although each team actually has 7 live players. Your 4 main players each have their own life bar of varying length, and some players move slightly faster or slower than others. You play in a rectangular shaped arena/court with a line down the middle. Your 4 main players reside on the left side of the rectangle, but you have 3 ‘outside’ players on the outside of the right half of the rectangle. Your goal is to kill the opposing team’s 4 main players by hitting them with the dodge ball until they lose all of their life bar, turn into an angel, and fly upwards to heaven (that is actually exactly what happens – they don’t just ‘fade away’ like defeated enemies in other games). Each of your 4 main players has their own ‘super shot’ to help eliminate the competition. Also, you can pass to your 3 players on the outside, who can also attack the opposing team, although they cannot be eliminated themselves. The opposing team can also do this with their outside players, of course. Neither team can advance over the center line – if they attempt to with the ball in their possession, they will be forced to drop the ball on the other side of the court, essentially causing a turnover. Once you kill all 4 players on the opposing team, you win and advance to the next opponent. If the timer runs out, the team with the most players left alive wins. In Story Mode, a UFO attacks you with a dodge ball, and…well, that’s it…game on. Who needs a detailed plot? Control: Button II throws the ball at an opponent. Button I passes, either to one of your 3 other main teammates (whomever is closest to you – they wave their hands when they want the ball), or, if you’re near the center line, across the court to one of your outside teammates. Pressing I and II together makes your character jump. While airborn, you can pass or throw the ball at an opponent. Pressing Toward, Toward makes your player run, and pressing II causes him to throw on the run. You execute supershots by running and pressing II, or by running, then jumping, then pressing II. Each character has a different ground super shot and jumping super shot. On defense, when the computer throws the ball to attack you, pressing I causes you to duck/dodge the attack, and pressing toward (in the direction the ball is coming from) and II right before the ball gets to you causes you to catch the ball. Sound and Music: Each country you play against has a different song, and they are very fitting for the country they represent. The sound effects are great. Each super shot has a different sound, and you really feel like you crushed it when you hear the sound of a dodge ball spiking off the face of an opposing team’s player. Each player issues a loud “Uggghhh!” groan when you kill them, letting you know he’s out of the game. When you kill opposing team’s players, they turn into angels. Also, for some reason, China’s team is full of overweight, out-of-shape players. So…the U.S. is the bad guy??? Yep. Remember, this game was released in Japan for a Japanese audience. I guess it’s a compliment that the U.S. is the last, and hardest, team you face. And who better than the United States’ greatest hero, Superman, to hand over the championship trophy to Japan upon the mighty United States’ defeat? The smug, pompous United States is the last team you’ll face! They’re tough to beat! Where can I find this game? You can order it on ebay from Japan, or download the rom for a PC Engine emulator on your computer. 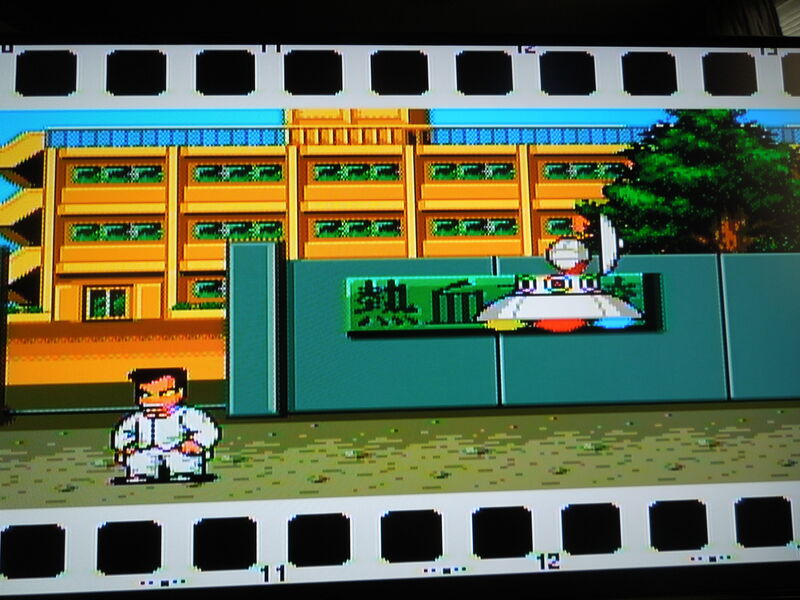 Conclusion: Super Dodge Ball for the PC Engine is a great sports game. If you’ve ever played Super Dodge Ball, it’s likely been the NES version, which is really fun, but a different experience from this game. 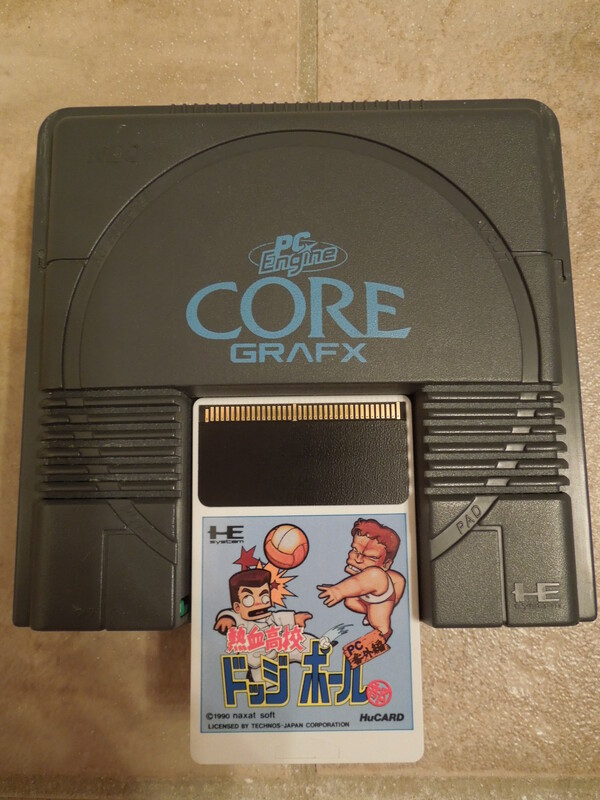 I’ve played both, and both are excellent, but I prefer the PC Engine version. It is extremely colorful and has no sprite flickering to speak of. The Story Mode version is really fun because this allows you to make your own ultimate team with captains from the other countries – this is the only way to play as a U.S. player. The VS mode is really fun with 2 players, but should have let you choose from all the teams in the game instead of just assigning you and a friend the Japanese team and Japanese All-Stars. As far as sports games go, this one is a great way to relieve tension and have fun at the same time, I must say.